For weeks the pincer of police, private security and National Guard surrounding the main resistance camp at Standing Rock, in Morton County, N.D., has been slowly closing. On Thursday morning, about 13 days after construction resumed on the final section of the Dakota Access Pipeline (DAPL), these state and federal forces moved in to begin clearing Oceti Sakowin, the main camp where thousands of Native Americans and their supporters, who call themselves water protectors, have gathered for months to oppose the project. Several dozen people remained in camp, however, vowing to stand their ground. On Thursday morning, however, at least a dozen military Humvees and at least three large armored military-style vehicles assembled on highway 1806 along the western edge of the camp. As a helicopter from the Department of Homeland Security circled low overhead, a massive force of police in riot gear and National Guard, flanked by armored vehicles and bulldozers, marched into the camp. On the other side of camp nine people could be seen joining hands around a sweat lodge where a prayer ceremony was apparently taking place. The Oceti Sakowin camp formed in August last year and quickly became the front line in the fight against DAPL. It served as the base for most of the direct actions that slowed construction of the pipeline and drew international media attention to the struggle. At the height of the protests the main entrance to the camp was lined by hundreds of flags from the different Native tribes across the Americas who had pledged their support. In December, faced with an earlier eviction threat, the camp drew thousands of supporters, including military veterans who promised to create a “human shield” around water protectors to defend them from police weapons that included rubber bullets, tear gas and a water cannon in below freezing temperatures. Instead of a forced eviction, on Dec. 4, 2017, the U.S. Army Corps of Engineers (USACE) announced it would not issue an easement for the pipeline company to drill beneath the Missouri River until a full Environmental Impact Statement (EIS) of the project could be prepared. The next day Standing Rock tribal chairman Dave Archambault II celebrated the decision and asked water protectors to leave camp: “They’re purpose has been served,” he told NPR. “Nothing will happen this winter.” Most people left the camps. Others, however, doubted that the pipeline company and incoming Trump administration would respect the decision. Hundreds opted to stay through the harsh North Dakota winter. When I travelled to Standing Rock in late November there were still several thousand people living in the camp. A system of communal kitchens was serving several thousand meals every day. When you said "thank you" to the people serving the food they would respond “thank you for the work you’re doing out there.” That’s what there was for an economy at Oceti Sakowin. It was hard to cross the camp without being drawn in to work on a project. This was not a “hippie protest” as some people tried to cast it—apparently without ever having set foot in North Dakota. This was a rural-based resistance movement. People there drove trucks and knew how to run heavy machinery, power tools and chainsaws. They kept horses and knew how to rig up wood stoves and solar panels. I went to work one day helping some carpenters hang plywood sheathing on the 2 by 4 frame of what can only be described as a small, two-story house. The building, which was to be a women’s space, was designed, framed, walled and roofed in a matter of a few days. The Oceti Sakowin camp was a Native-led, autonomously organized community on a scale I had never before seen. 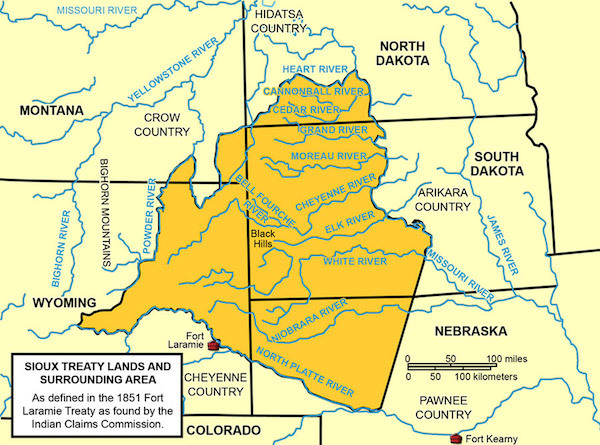 In the 1950s, the federal government seized more land from the Standing Rock Sioux when it built the Oahe dam on the Missouri River. The resulting lake flooded more than 200,000 acres of the Standing Rock reservation and the Cheyenne River reservation just to the south. The tribes lost 90 percent of their timber and much of their best agricultural land. Now, in order for the project to be completed, DAPL must tunnel under the Oahe reservoir. The land under dispute at Standing Rock, the Oceti Sakowin camp and the land through which the pipeline passes on its way to and under Lake Oahe, lies within the bounds of this unceded treaty territory. On February 3, 10 days after President Trump cleared the way for the pipeline via executive order, USACE ordered the evacuation of the camp by February 22, citing safety concerns and “the high potential for flooding.” Four days later USACE announced it would forgo the EIS and issue the final easement to complete the pipeline. To view Unicorn Riot's full livestream of the most recent raid, click here. I can sum-up your post in 4 words-Indians lost the wars! And that isn't B.S. Get over it! And, you did not disprove my post. There are no more "Indians!" Only U.S./State citizens with "Indian ancestry/race!" ... so many words to justify the theft of native land ... can be summed up with 2 letters ... bs. By Joseph Bullington" is an astonishing piece of a deplorable lack of journalist curiosity regarding U.S./State citizens with “Indian ancestry/race” since The Indian Citizenship Act of 1924! That single Indian Citizenship Act of 1924, made moot all previous common law-state and federal-including Presidential Executive Orders, Commerce Clause and Treaty Clause alleged Indian Treaties (if any U.S. Senate confirmed Indian treaties actually existed pre-1924 Citizenship) regarding U.S./State citizens with “Indian ancestry/race” so often touted by politicians and Indian advocates as being legitimate law. distinguishable the capacities, metes and boundaries of a select group of U.S./State citizens with “Indian ancestry/race” post citizenship. Subchapter F-Tribal Government Part 61-Preparation of Rolls of Indians, #61.4-Qualifications for enrollment and the deadline for filing application forms subparagraph (b)(i) Are of at least ¼-degree Pembina Chippewa blood." This excerpted section repeats "blood quantum" 15-times as a federal common law defining blood quantum required by federal Title 25-INDIANS to qualify for free everything paid-for by U.S. Taxpayers. BROWN v. BOARD OF EDUCATION, (1954) No. 10 Argued: December 9, 1952 Decided: May 17, 1954. 3. Indian reservations whereby a select group of U.S./State citizens with “Indian ancestry/race” reside exclusively and to the exclusion of all others, on land-with rare exception-that is owned by the People of the United States according to federal documents readily available on-line that notes rights of ‘occupancy and use’ by these distinguished U.S./State citizens with “Indian ancestry/race” only with the land owned by the People of the United States. 4. Recognition of ‘Indian citizenship’ asserted by various tribes. There is no international recognition of “Indian citizenship” as there is no ‘nation’ from which citizenship is derived.